Years ago, many, many years ago, I heard a bit from a Stan Freberg radio show about why radio was better than television. The bit featured a lot of impossible things, done through the magic of story telling and sound effects, that ended with something like a bunch of helicopters dropping a giant sponge on Lake Michigan sucking up all the water. The point being, that you could never pull that off on television. I think Steve Erickson, along with quite a few other contemporary novelists, have been up to something similar in print. Creating things that cannot be duplicated on television, or film. Stories that can only work, if not exist, on the printed page. 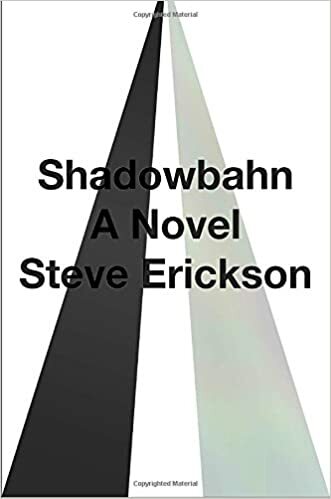 In his newest novel, Mr. Erickson creates an alternative America, a thrill ride of a world that begins with the mysterious appearance of the World Trade Center’s Twin Towers in the middle of the South Dakota Badlands. Crowds soon begin to form, but no one is willing to enter either of the two unharmed, silent towers. Inside one tower is Jesse Presley, the still-born twin brother of Elvis Presley. Jesse, now a full-grown adult man, is alone in the towers, which he cannot escape. Left to his own devices he reviews his life, one lived in a world with no Elvis. In this world, Jesse is the gunslinger featured in the famous Andy Warhol double portrait. Jesse, with no musical talent to speak of, still manages to become famous, sort of famous, through a connection with Warhol’s factory where he is ultimately shot by an angry Valerie Solanis. Meanwhile, there are two siblings, brother and sister though one is black the other white, on a road trip across America that takes a detour to the Dakotas once world of the towers spreads. The two drive almost without stopping until they end up on a strange, inter-dimensional highway, one that I’m not sure existed in our time or in some in-between world. Shadowbahn jumps between the three story lines until things become blurred between them and the story becomes increasingly chaotic. That it’s written, for the most part, in one-page two-paragraph chapters helps give reading it the feeling a putting together a puzzle. Except while you’re working with all of the pieces someone has taken away the box. So you have no picture to base your efforts on. I’m not sure what it all means but I enjoyed the ride, the same way I enjoyed Twin Peaks which has a lot in common with Steven Erickson’s work. Which kind of brings me back to my opening. If you asked me last year, if I had read this book last year, could it be made into a television show or a movie I would have said no. Not because the imagery is something that can’t be created, but because the events are too disjointed, the narrative to unstructured, for it to make sense in a way that would work. But after this summers Twin Peaks I’m not sure any of that matters anymore. If you saw a man driving a truck across an empty prairie for miles only to stop when the Twin Towers suddenly appear in the middle of no where. If the camera then moved to an interior shot where a man who is clearly the twin of Elvis Presley wonders around confused about where he is. You would probably just assume you were watching a David Lynch film and either go along for the ride or go for the door depending on your own personal taste. So much for Stan Freberg and his giant sponge.